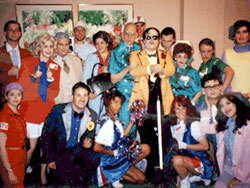 The first national Shock Treatment cast was formed in the middle 90's. Before its inception, there were a few casts here and there, mostly composed of performers from the usual Rocky Horror casts. Most notable were the first Shock Treatment cast, the "8th Row Players" of NYC, the cast from Cinema 35 in Paramus, New Jersey, the Castle Transylvanians of Maryland, and a few others. But this was the first ST cast composed of people from all over the country, and the world. The cast performed at a number of conventions, and all performers agreed on rotation of parts, that is, sharing ALL the parts at each con, so everyone would get a fair chance to perform. If we had 4 Cosmos, 2 of them would perform at one con, the other 2 at the next. We did the same with all the other parts, and it worked out very well. The ST cast went on to grow until it was no longer needed... there were now so many people that loved to perform in Shock Treatment that any host of a convention always had more than enough people willing to play all the parts, so organizing and scheduling a rotation was no longer needed. The official Shock Treatment cast was more or less disbanded, and from these humble roots a huge population of ST performers has been cultivated and ST has become a staple at every RHPS convention! THE SUN NEVER SETS ON THOSE WHO RIDE INTO IT!